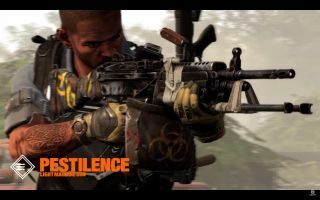 The Division 2 Pestilence Exotic LMG may be one of the weakest Division 2 Exotics in the game, but it's still worth grinding for if you want to own all of the exotic weapons. It released at the start of April alongside the Tidal Basin update, but you don't actually need to play the new stronghold in The Division 2 to get it. If you want to pick up the Division 2 Pestilence Exotic LMG, then read on for our complete guide. Plague of the Outcasts: After hitting the same enemy 20 times, that enemy is inflicted with the Plague of the Outcasts. Whenever an enemy with Plague of the Outcasts is killed, they leave a toxic cloud for 10 seconds that deals 200% weapon damage per second to anyone inside and inflicts them with Pestilence. Pestilence: This debuff reduces healing received by 50% for 10s. Whenever an enemy with Pestilence would be downed, they are instead instantly killed. The debuff is removed if the enemy is repaired to full armour. Outcast Resilience: While holstered, gain 20% bonus armour for 5s whenever you are affected by blind, bleed or burning. The way Pestilence deals damage is by enemies remaining inside the toxic cloud. The issue is that in PvP, players will of course leave the cloud immediately, while in PvE, the AI enemies will skirt round it. In PvE, the Pestilence talent won't even come into play anyway, because AI enemies are automatically killed no matter what. Much like Merciless and Sweet Dreams, Pestilence in The Division 2 is a random drop. There's some slight confusion around how to obtain the Exotic LMG since it's only been in the game for a few hours, but there's two definite criteria to it; you need to be in the Dark Zone, and you need to kill a named boss. From what we're reading on Reddit (we're still trying to verify and obtain the gun ourselves! ), Pestilence can either drop from named Outcast bosses in any Dark Zone territory, or any name True Sons bosses in the same areas. The gun itself specifically mentions the Outcasts in the inscription text however, so it may be a bug that's making it currently drop from True Sons. We'd recommend heading into one of the Dark Zones and farming landmarks until you clear ones held by Outcasts and obtain the weapon. Both Merciless and Sweet Dreams weren't too rare and there's multiple reports of Pestilence dropping, so it shouldn't take too long before you can get your hands on it. Be warned that it will drop as a contaminated item, so you'll need to extract it before you can get your hands on it! Guard that helicopter with your life. Literally. Make sure you also check out our guide to all 12 Division 2 masks!